I'm wondering if there are ways to make the pasta any fancier/tastier? Or do we simply stick to flour and eggs, and put the flavours into the sauce instead? Traditional pasta such as you describe uses semolina flour and eggs, but many recipes also call for milk. Buttermilk or sour cream is often used in vareniki. Spaetzle recipes often call for nutmeg. Rice noodle recipes don't use either wheat flour or eggs, but use rice flour, water, and an additional starch such as tapioca. Some recipes call for butter or oils, some use different kinds of flour, some include leavening agents like baking powder. There are even recipes for sweet pastas. In short, there are many different ingredients used in pastas around the world, and you should feel free to experiment with your own choices. The key is to maintain the correct dough consistency. if you add a liquid ingredient, you may need a bit more starch, and vice versa. Pasta Tricolore has added ingredients to enhance mostly presentation but also flavor, like tomato (red) and spinach (green). You may probably also add any other herbs and seasoning to your liking instead of spinach, like oregano or basil. Penne al Peperoncino is like regular penne but has additional hot peppers added to them. They are red colored and spicy. There is also "Nero di sepia" which is squid ink, that is added to pasta to make it look black or very dark, again mostly to enhance presentation, and to a lesser degree taste. I am guessing this may not be very practical to find/prepare on a regular basis though. 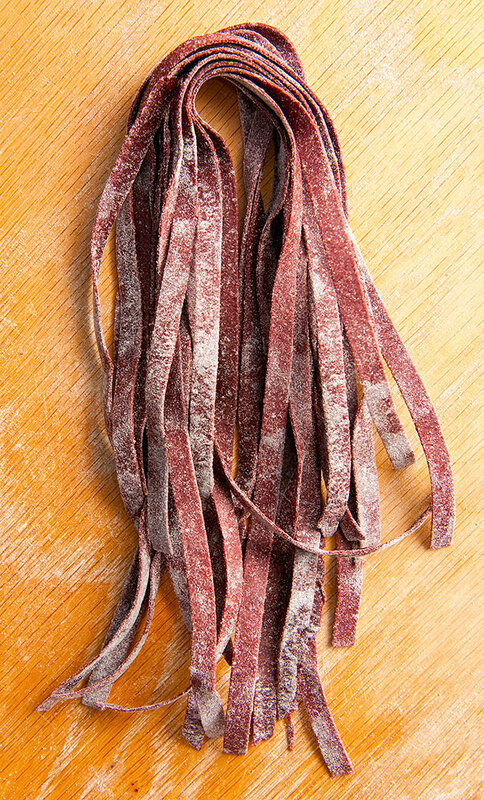 Some traditional Italian pastas also include animal blood to add coloring and taste. 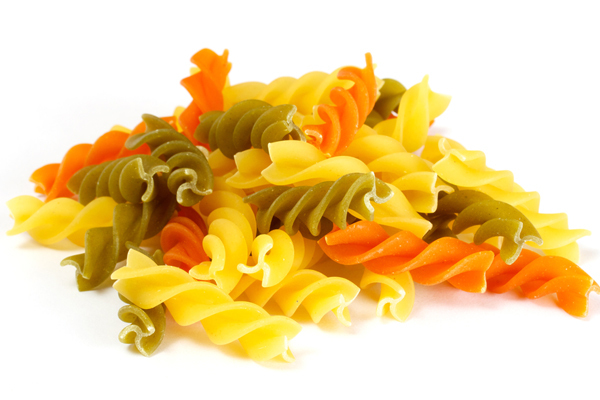 These are probably not your everyday-industrially-produced-prepackaged pastas you would find anywhere outside Itally. And even then I am guessing you wouldn't even find them outside maybe some remote traditional familiar environment. There are some wholegrain types of pasta which have a darker color, and slightly different taste and texture, and a few types of pasta made from other types of grain like buckwheat, or chestnut like Lasagne Bastarde. Also for reference, not something you can add to a regular pasta, but Gnocci is also made from potato or potato flour. The trick is fine ground spices added. Or even tomato or vegetable dry powders. Just add to the flour. 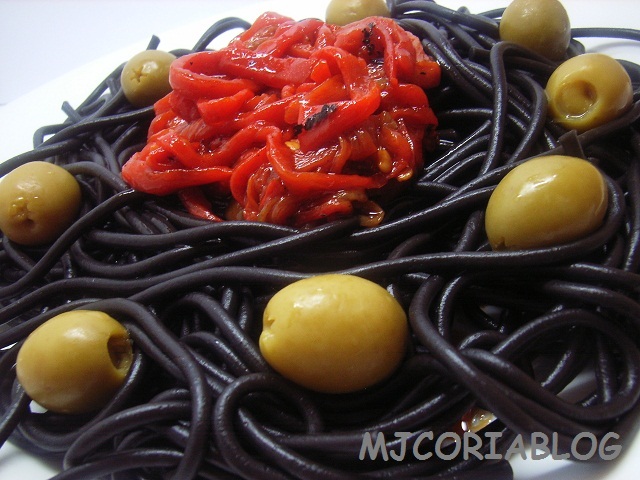 You can add roasted red pepper purée to make red pasta, spinach purée for green, and squid ink for black.